Calangute Beach is located 16 kilometers from Panaji, Calangute beach is popularly known as the "Queen of all Goan beaches". This beach was originally known by the name "kolli gutti", which means "land of fishermen". Due to the Portugal rule, the name got distorted and came to what it is presently known as. The place around the Colangute beach is abundant in coconut trees, which add serenity to the scenic surroundings.The Colangute beach is lined with local shacks, which serve amazing food and drinks. It is an ideal place to check out the local cuisines. Combined with chilled beer, music and lovely backdrop of the beach, it is the ultimate place to unwind and relax. To recharge your energy levels, indulge in the various water sports that are offered at the beach. There are many music concerts held there every now and then and is a favorite among music and art lovers. There is also an art gallery called Kerkar Art Gallery located on the beach, which attracts all art lovers who look for a soul-searching experience. It is said that the hippies were the first ones to find this beautiful land. As they spread the word among fellow hippies, the Colangute beach attracted more and more people and today is one of the busiest beaches in Goa thronging with locals and tourists. The beach has a leveled shoreline and not rocky at all. This makes it ideal for indulging in daring adventure sports and diving. By Air : The nearest airport is at Dabolim, which is 29 km away from Panaji. Panaji is just half an hour's drive away from Calangute..
By Train :The nearest railway station is at Karmali 11 km away from Panaji. Panaji is just half an hour's drive away from Calangute. 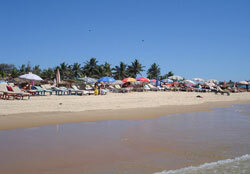 By Bus :Calangute Beach is about ten minutes from Mapusa, and thirty minutes from the state capital, Panaji. There are frequent buses to Panaji and Mapusa from Calangute. Most buses from Panaji terminate at Calangute and a few trudge further on up to Baga. Mapusa is 8 km away from Calangute.